Single Day Tickets Start At Just $39.99! Ohio's largest country music event, 92.3 WCOL Country Jam + Campout, returns Friday, August 16 and Saturday, August 17 to the historic Legend Valley, located just outside of Columbus, in Thornville, OH. The event will feature music from some of today's top country acts including Jason Aldean, Old Dominion, artist TBA, Randy Houser, LANCO, and many more, plus a Monster Truck parade through the venue, leading to the Monster Truck arena, where Monster Trucks will lay waste—crushing cars in an epic show. In addition, Woody's Saloon—Ohio's biggest honky-tonk—will feature line dancing with Dee Jay Silver, BBQ and beer, and a number of other attractions. 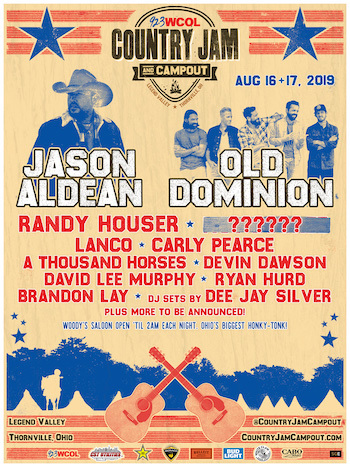 The music lineup for WCOL Country Jam + Campout is as follows (subject to change): Jason Aldean, Old Dominion, Randy Houser, artist TBA, LANCO, Carly Pearce, A Thousand Horses, Devin Dawson, David Lee Murphy, Ryan Hurd, Brandon Lay, and more, plus DJ sets by Dee Jay Silver. Presale tickets for WCOL Country Jam + Campout are on sale starting today, Monday, April 1, until Thursday, April 4 at 10:00 AM ET through WCOL. Single day tickets are available for as low as $39.99 (plus fees), weekend general admission tickets start at $84.99 (plus fees) and weekend VIP tickets start at $229.99 (plus fees). For passwords and more information on how to purchase presale tickets, visit www.wcol.com. Throughout the day and late into the night, attendees are invited to visit Ohio's biggest honky-tonk at Woody's Saloon. After music on the main stage concludes, the party at Woody's Saloon keeps going until 2:00 AM each night and will feature line dancing workshops, mechanical bull rides, oversized games including beer pong and giant jenga, lounge seating, photo ops, BBQ, beer and whiskey, and contests with chances to win VIP upgrades, backstage tours, merch and more. Get a little dirt on your boots and come experience the biggest house party at WCOL Country Jam + Campout in Woody's Saloon. Look for details about the WCOL Country Jam + Campout Monster Truck Show coming soon! 92.3 WCOL Program Director Dan E. Zuko says, "Jason Aldean at Legend Valley is a match made in heaven! Trust me when I say: this is a party you don't want to miss!" John Reese, founder of Synergy Global Entertainment (SGE) and producer of WCOL Country Jam + Campout says, "We're excited to join forces again with WCOL to bring Jason Aldean—one of the biggest stars in country music—and more of today's top country artists to Legend Valley for an incredible weekend of country music, camping, and BBQ. And the party goes til 2:00 AM each night at Woody's Saloon—with beer and cocktails, mechanical bull rides, line dancing and more at Ohio's biggest honky-tonk! Thank you CST Utilities for your support." The general ticket onsale for WCOL Country Jam + Campout starts Friday, April 5 at 10:00 AM ET. Single Day Reserved and General Admission tickets will also be available for purchase. Layaway plans are available as well. Visit www.countryjamcampout.com for details on all ticket and camping packages. The following three VIP ticketing options are also available for purchase. All VIP options include: One VIP festival admission pass to WCOL Country Jam + Campout; a dedicated VIP entrance into the festival; a commemorative Country Jam boot cup plus one drink token for a complimentary first boot beer; and access to the Country Jam VIP Lounge, which includes: comfortable areas to sit, relax and enjoy the show, views of the main stage from the VIP Lounge, private restrooms, along with games, a VIP bar, and convenient food options available for purchase within the lounge. VIP Lounge + GA Lawn tickets include all of the VIP perks listed above, along with General Admission Lawn Access seating for the show. Single Day tickets start at $149.99 (plus fees) and Weekend tickets start at $299.99 (plus fees). VIP Lounge + Reserved Seat tickets include all of the VIP perks listed above, along with a reserved seat located within the VIP Reserved Seat Section in rows 1-15. Single Day tickets start at $249.99 (plus fees) and Weekend tickets start at $499.99 (plus fees). VIP Lounge + Pit tickets include all of the VIP perks listed above, along with access to standing room pit area in front of the main stage. Single Day tickets start at $249.99 (plus fees) and Weekend tickets start at $499.99 (plus fees). WCOL Country Jam + Campout is produced by premier music festival production company Synergy Global Entertainment (SGE), which is responsible for some of the largest independent festivals across the country. WCOL Country Jam + Campout partners include: CST Utilities, Rockstar Energy Drink, Bud Light, Monaco Cocktail, Bulleit Frontier Whiskey, White Claw and more. Legend Valley is a historic outdoor concert venue and campground that has been hosting music festivals and athletic events since the 1970s, including the award-winning four day camping festival Lost Lands. Legend Valley is located at 7585 Kindle Rd, just off I-170 on Route 13 in Thornville, OH. The venue is located about 25 miles east of downtown Columbus, OH, just a short drive from many parts of the Midwest. John Glenn Columbus International Airport (CMH) is also easily accessible for those traveling from other parts of the U.S. and the world. Orange County, California based Synergy Global Entertainment, Inc. (SGE) is one of the world's premier music festival production companies. SGE events include music and lifestyle festivals across a variety of genres and interests, with over 100 major festival dates planned for 2019. SGE produces or co-produces Back To The Beach; Surf City Blitz; Big Adventure; Driftwood; ID10T Music Festival + Comic Conival; Knotfest; Lost Lands (Your EDM Best Festival of 2017 and Noiseporn 2017 Festival Of The Year); Moonrise Festival; MUSINK; Ohana Dana Point; Sabroso Taco, Craft Beer & Music Festival; 92.3 WCOL Country Jam + Campout; Scallywag!, and more. In addition, SGE co-produced the Rockstar Energy Drink Mayhem Festival and the worldwide Rockstar Taste of Chaos, and created and produced the Identity Festival, Oddball Comedy and Curiosity Festival, and Rockstar Energy UPROAR Festival. This year's SGE-affiliated events are projected to sell over 1.2 million tickets. In addition to festival production and promotion, SGE's in-house sponsorship agency procures and executes a multitude of partnerships in varying forms for global brands, top-tier artists, international booking agencies and more. 92.3 WCOL is Columbus's #1 for New Country. WCOL is owned and operated by iHeartMedia Inc. iHeartMedia is a leading global media and entertainment company specializing in radio, digital, outdoor, mobile, social, live events and on-demand entertainment. It operates 850 radio stations, serving more than 150 markets throughout the U.S., and has over 125 million registered users through digital and mobile platforms. With over a quarter of a billion monthly listeners in the U.S., iHeartMedia has the largest reach of any radio or television outlet in America. Legend Valley is a 230 acre live music venue and campground that has hosted concerts, music festivals and athletic events since the 1970s. Located in Central Ohio, this historic outdoor concert venue and campground is home to the award-winning four day camping festival Lost Lands, as well as Camp Punk In Drublic, Hookahville, Gathering of the Juggalos, All Good Festival, Dark Star Jubilee, The Werk Out, WCOL's Country Jam, and numerous other events.